Trump hotels have become easy targets for vandals and activists since President Donald Trump took office in January. 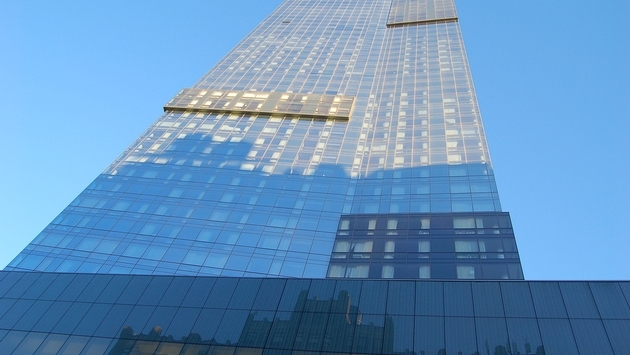 Amid the ongoing controversy over Trump's potential ties to Russia, video journalist and activist Robin Bell temporarily vandalized the five-star Trump SoHo in New York on Monday night. According to Business Insider, Bell projected an image of Russian President Vladimir Putin onto the hotel. The image was accompanied by several phrases, including "Happy to Help, Bro," "Follow the Money" and "Laundering Services Available." The elaborate presentation even featured actors dressed in military uniforms standing at attention in front of the hotel. The protest comes just days after special counsel Robert Mueller impaneled a grand jury in the FBI's investigation into potential ties between Russia and the Trump campaign. This isn't the first time Bell has vandalized a Trump hotel, either. In May, he projected "Pay Bribes Here" and "Emoluments Welcome" onto the outside of the Trump International Hotel in Washington, D.C.
Bell told CNN he hoped to draw attention to accusations that Trump was providing foreign leaders access in exchange for booking rooms at his hotel. Bell warned that more projections were to come. "We're going to keep going," he said. At this point, it's likely not if but when and where the next projection will show up.